Windows 10 comes with lots of advanced features, and in order to make this operating system more perfect, Microsoft’s engineers already launched various updates for Windows 10. Some of the major updates are Windows 10 Anniversary Update, Windows 10 Creators Update, and Windows 10 Spring Creators Update. These updates contain patches for bugs and faults. Lots of new features are also being rolled out along with extra improvements and bug fixes. It is important for any Windows 10 PC/Laptop that packed with the available update. But while installing updates sometime user may face update error, once this error appears it prevents the user from downloading the update. In this blog, we will talk about error code 0x80070020. This update error code is very irritating which prevents users from installing the latest version of Windows 10. Error 0x80070020 is one of the most common Windows update errors that appear when trying to upgrade the Windows system. Although it is necessary to overcome from this error message in order to download and install the available update. 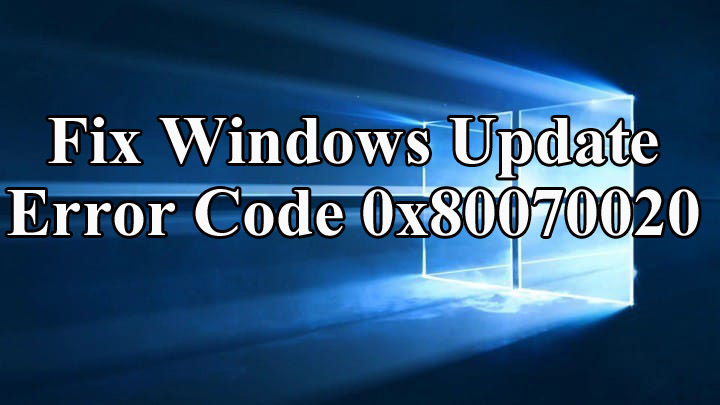 If you are suffering from error code 0x80070020 then don’t worry as you can easily deal with this with the help of below-given fixes, simply follow one by one and get rid of error code 0x80070020 immediately. Active antivirus program or another security program can prevent installation of updates. The system is infected with computer virus/malware infection. Directx Error after Updating to Windows 10 Creators Update? Modem Error 633 after Windows 10 Creators Update? How fix Windows 10 update error 0x80070020? Sometimes installed third-party antivirus programs may interrupt the downloading of Windows update. It happens when Operating System is not fully compatible with the installed antivirus or any other system security program. This confliction issue can affect the various Windows features, including Windows Update process. So, it is recommended to start the updating process after disabling the antivirus program. After installing and downloading Windows 10 update you can again enable the antivirus program. Open Run Dialogue box by pressing Windows key + R and type msc, press enter key. 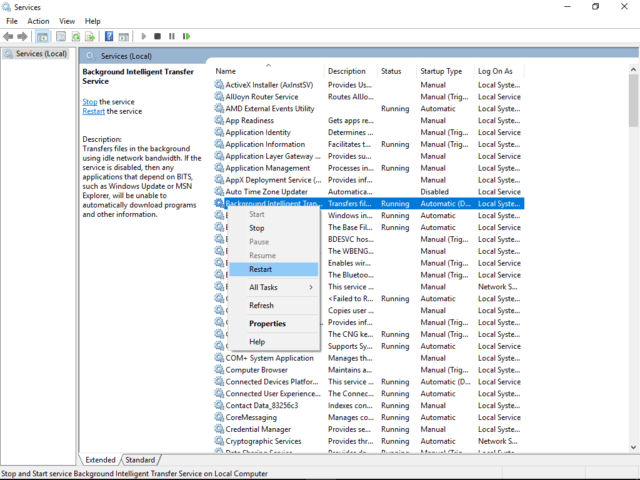 A window will appear, find the Background Intelligent Transfer Service and right-click it. At last, save the changes and close Services window. You need to create a script known as called WUReset, this script will help you to deal with update issues in Windows 10. Open Start Menu and right click on Command Prompt -> Select Run as administrator. This command will take few minutes to scan your PC. To use Windows update troubleshooter first you need to download this tool from the official Microsoft website. Download from here: Windows Update Troubleshooter. After downloading run this tool. Simply go with the on-screen instructions. 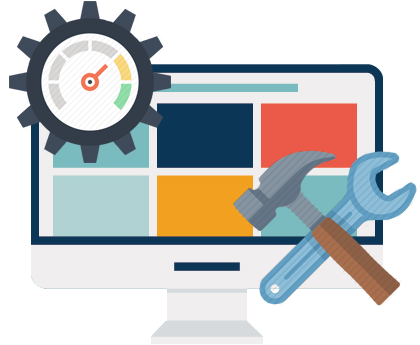 If any errors are found by this tool then it will be fixed automatically. You should also run CHKDSK utility, this will help you to repair bad sectors which can cause error 0x80070020 and many other Windows errors. Click on the “Yes” to open up. Now, type “chkdsk” and “C“, which is the system drive. Note: It is recommended to leave a single space between “chkdsk” and the drive letter. Hit ENTER to run this command. As in the introduction section, it is discussed that error full and virus/malware infected systems are getting unable to download any Microsoft update. So it is recommended to make sure that your system is malware and error-free, to achieve this task via the manual method is completely impossible. You should go with a professional PC ERROR FIX tool. 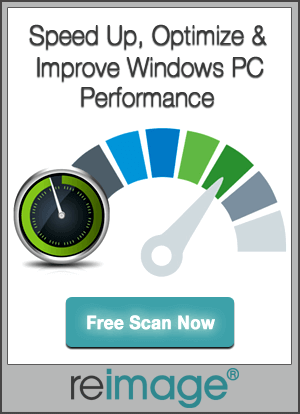 With the help of PC ERROR REPAIR TOOL, you can fix all types of Windows errors. Simply download and install this repair tool and run it on your PC. It will scan your Computer and Laptop very deeply and make your system error free automatically.